Italian guitar wizard Beppe Gambetta (above) begins this week a month-long tour in the German-speaking countries of central Europe and in Italy. In the schedule below, all shows listed are solo concerts unless otherwise stated. Full details can be found here. 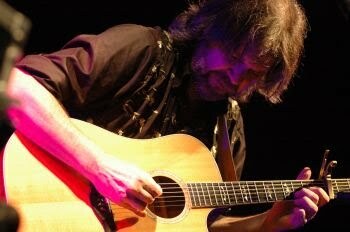 Acoustic Music Records (D) will publish Beppe Gambetta's new DVD/book set, The art of flatpicking guitar, at the end of November. Photos from the Beppe Gambetta International Workshop (held in Slovenia in August, with Kathy Chiavola (USA) as guest teacher of the year) can be seen here. Instructional material online can be found here, and a new book with ten Beppe Gambetta originals will be available at concerts. Beppe, who has recently updated his official website with news, videos, and pictures, also maintains a presence on Facebook, MySpace, You Tube, Reverbnation, Flatpicking Guitar Network, Last Fm, and Plaxo. Finally, his updated list of favourite restaurants in three continents (including eight European countries) is now available.